The largest global sports media property in Asian history, ONE Championship™ (ONE), had another memorable and historic evening in the Lion City as the capacity crowd at the Singapore Indoor Stadium witnessed an amazing display of heart-pounding martial arts action. ONE: HEART OF THE LION featured compelling bouts, including a highly-anticipated world title unification rematch that served as the centerpiece of the blockbuster card. In the main event, Kevin Belingon of the Philippines became the undisputed ONE Bantamweight World Champion, defeating Brazilian legend Bibiano Fernandes. In the main event of the evening, Kevin “The Silencer” Belingon of the Philippines ended the near-five year reign of now former belt holder Bibiano “The Flash” Fernandes of Brazil to successfully unify the bantamweight titles. 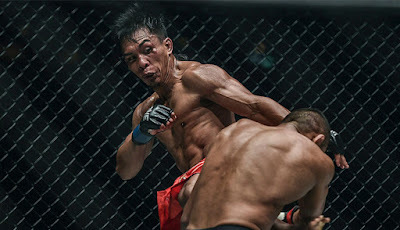 Belingon employed a terrific game plan, attacking Fernandes’ body with thudding spinning back kicks while connecting on fiery boxing combinations. Fernandes did his best to take the action to the ground, but Belingon showed much improved grappling skills. After five rounds of action, Belingon took home the victory via split decision and was crowned the undisputed ONE Bantamweight World Champion. In the co-main event of the evening, former ONE World Title challenger Christian “The Warrior” Lee gave fans at the Singapore Indoor Stadium a reason to celebrate after defeating Japan’s Kazuki Tokudome via technical knockout in the first round. Lee weathered Tokudome’s takedown efforts in the opening moments of the bout before landing a solid right straight that dropped his Japanese opponent to the canvas. Lee finished the task at hand by raining down piston-like ground shots, forcing the referee to step in and wave it off. The legendary Giorgio “The Doctor” Petrosyan once again showcased his exceptional kickboxing pedigree on the global stage, putting on a striking masterclass to defeat Muay Thai star Sorgraw Petchyindee Academy via unanimous decision. Petrosyan overwhelmed Sorgraw with his world-class boxing skills, unloading a barrage of thunderous punches while also displaying impeccable defense. After three rounds of action, Petrosyan was declared the winner, further extending his remarkable streak of victories. Female strawweight contenders Tiffany “No Chill” Teo of Singapore and Michelle Nicolini of Brazil put on an absolute show to the delight of a packed Singapore Indoor Stadium crowd. For 15 minutes, Teo and Nicolini gave everything they had and left it all inside the cage. While Nicolini showcased her world-class grappling, it was Teo who kept her opponent on the end of some powerful striking combinations. After three rounds of gruelling action, Teo took home the hard-earned victory by unanimous decision. Australia’s Adrian “The Hunter” Pang triumphantly returned to the winner’s circle with a technical knockout victory over Japan’s Kota Shimoishi. Pang, showcasing his incredible toughness and durability, punished Shimoishi both on the feet and on the ground with heavy strikes in the first round. Unfortunately, Shimoishi was unable to answer the call for the second round, and Pang was awarded the stoppage win. Two-division Lion Fight World Champion “Smokin’” Jo Nattawut overcame a tremendous size disadvantage to pick apart Scotland’s George Mann en route to a dominant unanimous decision victory. The smaller Nattawut did a masterful job of negating the much taller Mann’s reach by connecting on blistering combinations to keep the lanky Scotsman at bay from the first round to the final frame. In the end, Nattawut’s clinical display of technical striking was enough to have his hand raised in triumph. Three-time IFMA Champion Alaverdi Ramazanov of Russia made quick work of Scotland’s Andrew Miller, winning by knockout in just 57 seconds. Miller came out aggressively, throwing combinations that had the 23-year-old Russian striker moving backwards. As his cage counterpart pressed the action, Alaverdi patiently picked his shots before he drilled his opponent with a flurry of punches that ended with a well-placed right uppercut to shut the lights off on Miller for the victory. Grappling superstar Garry “The Lion Killer” Tonon emerged triumphant in a featherweight contest against South Korea’s Sung Jong Lee. The multiple-time BJJ world champion showcased a much-improved striking arsenal for the majority of the bout before taking matters to the ground midway through the second round. On the mat, Tonon displayed his dangerous submission skills, quickly and effortlessly locking in the guillotine choke to claim the victory. Former ONE Strawweight World Champion Dejdamrong Sor Amnuaysirichoke returned to his winning form against Himanshu Kaushik, submitting his Indian opponent with a rear-naked choke in the second round. Dejdamrong dominated all throughout the contest, drenching Kaushik with his Muay Thai combinations while controlling the action on the ground. After taking Kaushik’s back in the second frame, Dejdamrong sunk in the bout-ending maneuver to force the tap. In a ONE Super Series Muay Thai Bantamweight contest, highly-decorated kickboxers Muangthai P.K.Saenchaimuaythaigym of Thailand and Panicos Yusuf of Cyprus put on an incredible striking showcase. Both men employed fiery offense from bell to bell, with Muangthai utilizing his speed and power to connect on a handful of thudding strikes on Yusuf, who was knocked down in the first round. Banking on his solid hooks, Yusuf managed to keep the bout competitive in the second and third frames. After going back-and-forth for three rounds, Muangthai was declared the victor by unanimous decision. Shuya “Stealth” Kamikubo of Japan scored his second consecutive win on the ONE Championship stage, overpowering Malaysian dynamo Muhammad “Jungle Cat” Aiman with a masterful grappling performance. Kamikubo did not miss a beat over three rounds, rattling his opponent with his ground-and-pound for the majority of the contest. Kamikubo punctuated his performance by grinding out Aiman in the final round, steering himself to a unanimous decision victory. China’s “The Stalker” Xie Bin marched to victory inside the ONE Championship cage, submitting Hisyam Samsudin of Malaysia in the first round. After pressuring his opponent on the offensive end, Xie wasted no time in scoring on a takedown in the opening moments of the contest. Once the action hit the canvas, Xie effortlessly secured dominant position, capitalizing on Samsudin’s inferior grappling defense to fasten a tight D’arce choke that put his opponent to sleep. 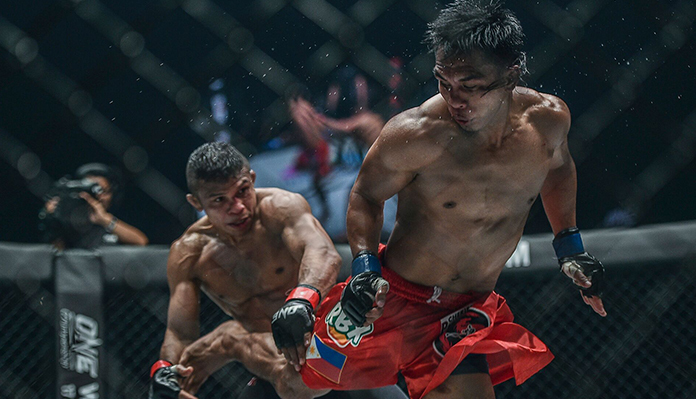 Setting the tone for an action-packed evening was a featherweight bout between Indonesian-Dutch standout Anthony “The Archangel” Engelen and Cambodia’s Meas Meul. Engelen made a triumphant return to ONE Championship, knocking out Meul in the first round. He needed just 39 seconds to get the victory, turning the lights out on Meul with a thunderous high kick. Earn Bitcoins Sign Up Here Now!!! Get FREE online storage space to access your files anytime, anywhere! Bringing the best Filipino brands to the world. Missing Martha Cecilia on MC Day. All logos and pictures are copyrights of their own brands, if in anyway this has been abused or misused by this website, please feel free to contact me and the picture/logo will be deleted immediately. Manila Life 2010. Theme images by RBFried. Powered by Blogger.